The Western New York area has a rich and proud railway heritage spanning over 150 years. Numerous trunk line, short line, interurban and city street railways criss-crossed the region, and Buffalo, because of its geographic location on the Great Lakes, grew to become the nations second largest railroad center. With this growth came many railroad related industries which contributed significantly to the development of railroad technology throughout the world. Heritage DiscoveRY Center In August 1980 the Western New York Railway Historical Society, Inc. was founded to ensure that what remains of our Railway Heritage is preserved for present and future generations. Our primary goal was achieved in October of 2010 with the establishment of the "Heritage DiscoveRY Center" a permanent railroad museum, to house, preserve and display railroad equipment, photographic collections, numerous paper items and hundreds of railroad related artifacts. 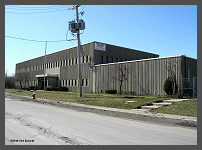 Many Society functions are held at the Museum, 100 Lee Street, Buffalo, New York, 14210 each year. 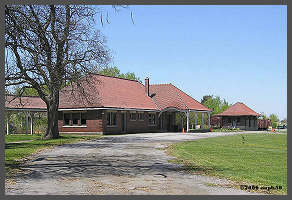 The Society has restored to its original state, the former Buffalo, Rochester & Pittsburgh Railway (Baltimore & Ohio) passenger station and freight depot (built in 1912 and 1913) in Orchard Park, New York. Restoration work is nearly complete on the former Lehigh Valley Railroad depot which was built in 1896 in Williamsville, New York. 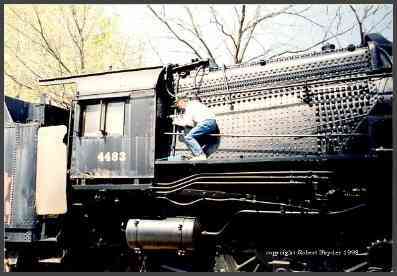 Other projects are the operation of chartered steam and diesel powered railroad excursions. Our involvement also extends to sponsoring a bi-yearly Railroadiana, Model Railroad and Toy Train Show and Sale, which is one of the largest in the Northeastern United States. In addition, many of our members are actively participating by lending their time and talent to the restoration and maintenance of our growing fleet of prototype steam and diesel locomotives, including PRR I1sa #4483, passenger cars, freight cars and cabooses. Some of these cars have been made available on a lease basis to other historical societies for excursion service. As the largest, independent Rail Historical Society in New York State, with almost 500 members, we have been recognized by the Buffalo and Erie County Historical Society as recipients of the 1986 Niederlander Award, "For special achievement by a local historical society" in preserving our Railway Heritage. 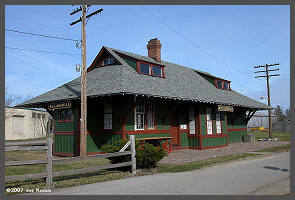 In 2013 the Orchard Park Depot received the prestigious "Preservation Buffalo Niagara Award." As one of Western New York's preeminent preservation organizations, they selected the Orchard Park Depot to receive an award for their conservation and stewardship of the Orchard Park BR&P railroad depot. Formed in 2008, Preservation Buffalo Niagara's mission is to provide leadership in identifying, protecting and promoting the unique architecture and historic legacy of Western New York communities. A "Roll of Honor" has been established to recognize the tens of thousands of men and women, living or deceased, and employees on the railroad, interurban and city street railways, and railroad related industries, who contributed so much to our Western New York Railway Heritage. For $100 a plaque will be mounted on a permanent display board in the Orchard Park, New York depot, bearing the name, occupation, railroad (industry) and years of service. Your donation will be applied toward our continuous preservation efforts. The Western New York Railway historical Society, Inc. has been designated under the Internal Revenue Service Code of 1954, section 501 (c) (3) as a publicly supported, non-profit organization. The Society is also registered with the New York State, Department of State, and The Attorney General. The Society has also been granted the reporting mark of "WNYX" by the American Association of Railroads. check back for updates and restoration progress! What's New & Updated ! 1/12/17 PRR I1sa, 2-10-0, #4483 "OLD PHOTO ALBUM"
The WNYRHS, Inc. P.O. Box 416, Buffalo, NY. 14231-0416 is an independent organization and has no affiliation with any other local or national group. The Society is a fully qualified organization under 501 (C) (3) of the Internal Revenue Code and all donations to the Society are tax deductible. Web Design & Hosted by - Scott H.